Join VisualSP for a free webinar, Thursday, June 11, 2015, and find out how the VisualSP App can support SharePoint Online users by providing inline and in-context help and learning. 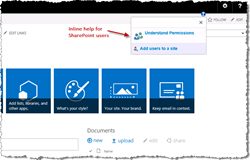 VisualSP will host a no-cost webinar, "In-Context, On-Demand Help for SharePoint Online (Office 365) Users" on Thursday, June 11, 2015 at 2:00 pm Eastern. The goal of the webinar is to help SharePoint Online users to be successful by using a performance support tool that can help them when and where they need help. The webinar will be presented by Asif Rehmani, SharePoint Server MVP, MCT, author and SharePoint adoption evangelist. During the Webinar, Rehmani will demonstrate the VisualSP App - which provides users with inline and in-context help and learning. This app helps the users by showing them why certain tasks are done and how to do them using video tutorials, tip sheets and screenshots, reference documents and articles and links to resources online. This webinar will demonstrate the power of the VisualSP app and how one can acquire it for their SharePoint Online (Office 365) users.